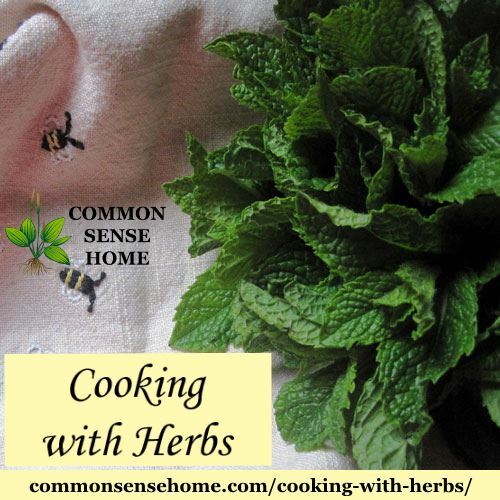 This is a guest post from Jennifer Downing of Nourish about cooking with herbs. I love my vegetable garden. It’s tucked in the corner of the yard surrounded by a white picket fence. It makes me happy. Buzzing with honey bees from our hive, bushels of beans and towering tomatoes, this modest garden produces a lot of food for my family. I dream of acres and neat rows of rotational planting but ironically, the yellow house garden has wonky paths and a patchwork of seed plots. It’s fun, but not efficient. So, it may make sense a disproportionate percentage of my garden is filled with randomly placed herbs. They creep across the dirt and sway in the breeze. In spring, I anticipate the arrival of perennials like old friends. Selecting annuals is thrilling as I search for something new to play with in the kitchen. Since many herbs are easy to grow, I am left with little do but harvest and, harvest, and harvest. I step into the garden, gather fragrant arm loads full and return to the kitchen and get cooking with herbs. Which Herbs are Best Fresh, Which Herbs Can be Cooked? The most important thing to remember when cooking with herbs is to use the different types in the best way to allow their distinctive flavors to shine. Tender herbs such as parsley, chives, basils, and cilantro should be treated with care. Best used fresh, finish or garnish your dishes to release their potency. Over-cooking soft-stemmed herbs can result in muddy color and loss of bright flavor. Just before using tear or coarsely chop them to release the essential oils and avoid browning. Do you spend too much time picking leaves? The soft stems of tender herbs, such as parsley and cilantro, are valuable so chop the less fibrous upper stems and toss them into your dishes for extra flavor. 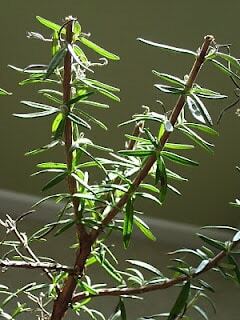 Herbs with woody stems like this rosemary hold up well to cooking. 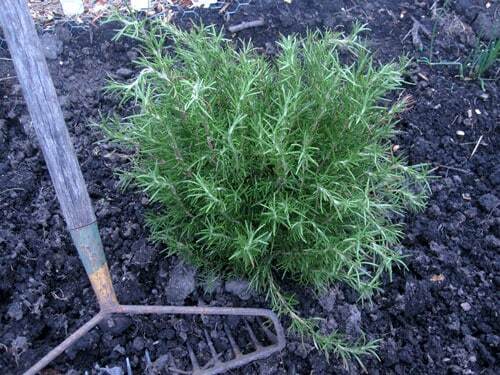 More hearty or woody stemmed herbs: rosemary, thymes, oreganos, and marjoram can tolerate longer cooking. Their stronger flavors infuse a savory dish and with a mellow warmth that is equally delicious when paired with sweet baking. When making a lemon pound cake with rosemary, carefully strip the leaves against the direction of growth then chop before adding to your recipe. If roasting or braising, whole sprigs are ideal after a good wash to remove dirt. Prior to serving the dish, the stems, now bare of leaves can be discarded. Armed with herb basics the possibilities when cooking with herbs are endless. Which Herbs Should I Use With Which Vegetables or Fruits? The adage, “If it grows together, it goes together.” solves much of the mystery surrounding fresh flavor combinations when cooking with herbs. Tomatoes and basil peak at the same time (check out this wonderful tomato-basil sauce) and growing alongside zucchini is lightly balsam-scented marjoram. Thanksgiving turkeys call for sage as the days grow shorter, but don’t wait to bring its unique flavor to the table. Soft grayed leaves of sage add richness to my summer vegetable dishes. Add it to creamed fresh corn and I promise bad childhood memories will disappear. Many mistakenly cook with herbs in only savory dishes, but the surprise of herbs paired with fruit is amazing. A spring strawberry-tarragon jam lingers in taste memory. Pine-y rosemary and late summer peaches made for a lovely peach rosemary cocktail enjoyed on the porch in the rosy glow of a warm evening. Crisp autumn apples and a handful of woody herbs became a simple apple rosemary syrup with a myriad of delicious uses. Roast pears and fresh thyme for a smooth sauce welcome after a summer of potato salad. Last spring a spur of the moment rhubarb-lavender crisp was delightful, so why not try it with plums? Be creative in your kitchen when cooking with herbs and you won’t be disappointed. How do I get started cooking with herbs? What is the best advice I can offer for adding the special flavor of herbs to your cooking? Use them! Harvesting encourages growth and ensures continued bounty until Indian summer flees. I find the more I experiment, the more I often I use them. Be creative in your herb kitchen, you won’t be disappointed. Hurry to your garden or local market to grab these cook’s gifts. Bake a coffee cake (like this tarragon-blueberry bundt cake), sit back and, watch the leaves begin to turn. Soon you’ll on a mission to preserve every last sprig. With a knife or corn stripper remove kernels from the corn cobs until you have approximately three cups. In a large saucepan bring cream to a boil over medium-high heat. Add corn and return to a boil; then reduce heat to low and return to a slow boil. Stir until often and cook until cream has thickened and nicely coats the corn. Remove pan from the heat, stir in the butter, herbs, salt and pepper. This may be made in advance. Set aside at room-temperature partially covered. Gently re-heat before serving. With a love for everything edible, the kitchen is the place Jennifer Downing is most at home. Her business, Nourish, affords her the opportunity to share her enthusiasm for teaching through cooking classes and demonstrations, and hosting trips focusing on fresh foods. Some of her specialty workshops include home cheese making, preserving, and sausage making. Jennifer’s vast food knowledge and involvement with local food policy organizations informs her delicious instruction. She fills her classes with useful techniques, tips and strategies to help her students nourish their lives and feed those they love. Jennifer lives in the western suburbs of Chicago with her husband, four kids, two dogs and four backyard hens. In her spare time you may find her in the garden, reading, and writing about her many passions. Why you might be wasting your time if you buy shredded cheese. What a lovely post and I too keep bees 🙂 Would love for you to join our blog hop on Wednesdays! It will be so much fun! I love partnering watermelon, feta and mint. It’s a great summer dish. I had a really good crop of basil last summer. I chopped a bunch really fine and added it to my butter cookies. They were amazingly good. I’m going to try other herbs this year. Interesting. I wouldn’t have thought of cookies and basil.